In everyday life we often face the need to glue two metal object. Second adhesive, which in recent times has become popular to glue everything, in this case not do. Contact a proven and reliable method of gluing pieces of metals of different alloys. First, you have to go to the store. Better not to waste time looking for the necessary funds in otetela economic or construction of goods, and immediately head to the auto parts store. This is where you can find two-component "cold welding", which is the best job of bonding metal objects. Choose a tool, set which includes two tubes: the active substance and the hardener. 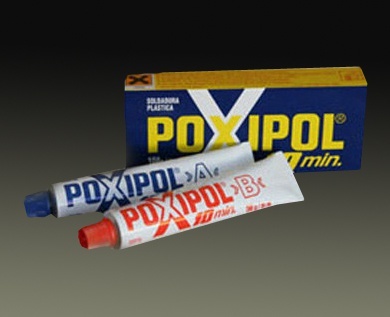 This may be the same Poxipol or other epoxy glues. In the same shop buy a small bottle of any solvent. After returning home, degrease the bonding surface with a solvent to ensure the best contact. If the surface of one of the items have rust, clean it with emery paper or wire brush. Once all is ready for gluing, mix the active substance with the hardener in equal proportions, apply the entire mixture to the bonding surfaces and press them to each other. Curing time for most epoxy adhesives is between 5 and 15 minutes, so you should act quickly. Use glued objects to destination immediately after full cure. "Cold welding" glues well not only metal but also plastic and wooden objects. After the glue hardens, it can be treated with a file, sandpaper, angle grinder machine ("Bulgarian") and any other tools that can shape metal.